How many times have you bought fresh lettuce at the farmers' market or grocery store, only to have something come up and realize you won't be able to use it as quickly as you had planned? You put it in the frig in a plastic produce bag hoping it won't be too badly wilted before you are able to make that luscious salad you had planned. Then, you forget about it and find it a week later too wilted and mushy to revive. Well, read on, because here is a fool-proof way to keep it fresh and crisp for several days. Here are a couple of bunches of leaf lettuce we had left over from the farmers' market. First, I cut about 1/8 inch off the end. Then. I filled the cup about a third full with water and put the lettuce in it. Finally (and here's the secret to keeping it fresh), I put a plastic produce bag over the lettuce, secured it to the cup with a rubber band and put it in the refrigerator. I've had lettuce keep for over a week using this method. It does take up some shelf space, but at least it is visible and you are unlikely to forget about it! Although spring is still a week away, we are having some nice warm days and everyone is itching to get out there and start planting seeds. However, here in Oklahoma where we live, the average last frost date is April 15, so it is a little risky to put out tender plants until the danger of frost is past. In order to get the nice individual heads that we sell at the farmers' market, we start lettuce seed in cell packs and put them in our small greenhouse. Here's some that was started a couple of weeks ago. Once it gets to be about this size, we plant the individual little plants. 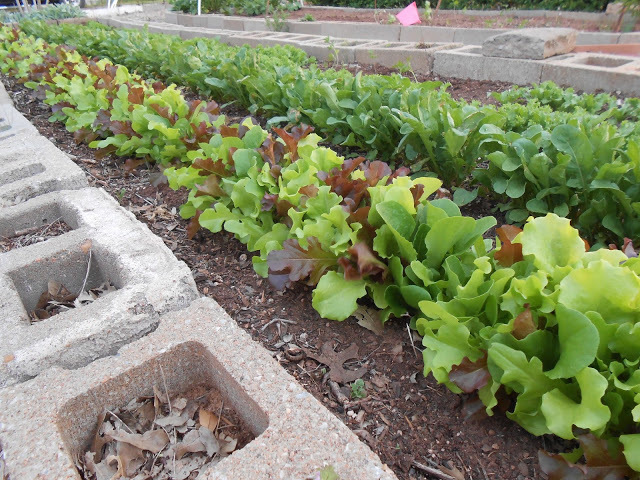 We grow several varieties of lettuce. Every year, we drool over the seed catalogs and have a difficult time deciding what kinds to order. There are several "tried and true" varieties that we grow every year. But, we like to try a couple of new ones every year. Here are a few of the different kinds we've grown this winter. As the spring warms up, we mix several varieties together and sow them outside in rows like this. This is easily harvested by grabbing a handful and cutting it off about an inch above the ground. Then, in a few days new leaves will begin to grow from the stub that is left. This is called the "cut and come again" method and you can get about 3 cuttings off the same patch of lettuce. Lettuce is easy to grow and I encourage you to try it. You can stash it between flowers in your flower beds or even grow it in pots on your patio. A word of caution, though. It does not like hot weather and will bolt and turn bitter when hot weather arrives. So, now is the time to start planting it. If you sow a few seeds every couple of weeks during the spring, you will be able to enjoy fresh greens for several months.